If you are looking for something in particular, type in a keyword below. Add half the water to the flour and whisk thoroughly. Add more water if required. Brush the mix on one half of the wrap and fold into a cone shape. Add Love Fresh Cheeseburger Melt. Brush the mix on the inside edge of the wrap and seal with your fingers. Deep fry at 170ºC for 5 minutes. Position on a board or plate. Serve burger relish and gherkins on the side. Click here to watch the recipe tutorial video. Grill a succulent juicy beef burger and slice a toasted brioche burger bun. Dress the base of the bun with House of Lords Blazing Louisiana BBQ Sauce and then add two cos lettuce leafs and a slice of tomato. Place the cooked burger on the tomato and lettuce and cover with our Love Fresh Cheeseburger Melt. Place under a pre-heated grill. Let the melt go to work as you heat through. Remove from the grill, place the bun lid on top and serve with fries. What a combination! This will take your burger to a whole new level. 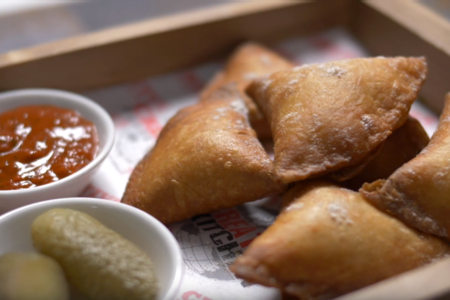 A deliciously simple snacking delight or serve as a tantalising starter. 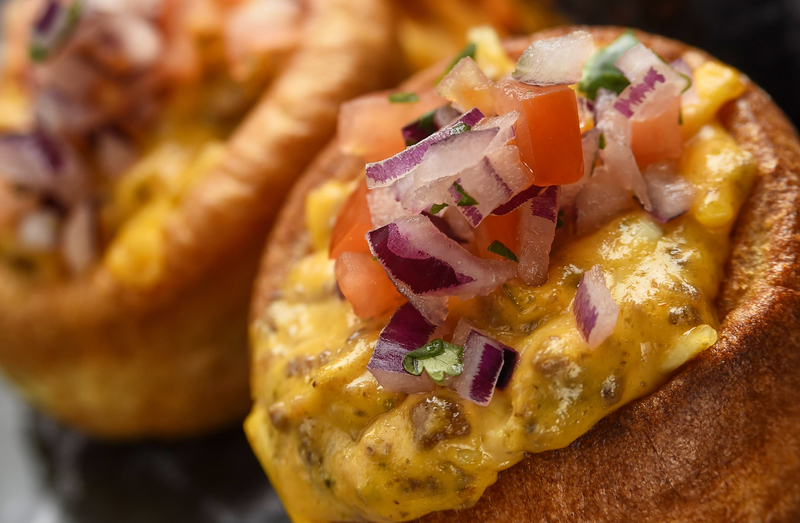 Place the nachos in a serving bowl and drizzle with House of Lords Kansas City BBQ Glaze then spoon over lashings of our Love Fresh Cheeseburger Melt. Place under a pre-heated grill and thoroughly heat through. Remove from the grill add some hot red salsa and finish with some chopped spring onion. It’s a taste bud buster!! A Yorkshire Pudding with a difference! pre-heated oven at 180ºC and heat for five minutes. Once out of the oven sprinkle with a mix of diced tomato and onions and finish with some crushed nachos. Innovation the Yorkshire way! The Hot Dog to beat all Hot Dogs! Chef’s tip, soak some sliced onions in milk for half an hour, drain and deep fry until crisp and golden. Heat the hot dog sausage, split a hot dog roll down the centre and place the sausage on the roll. 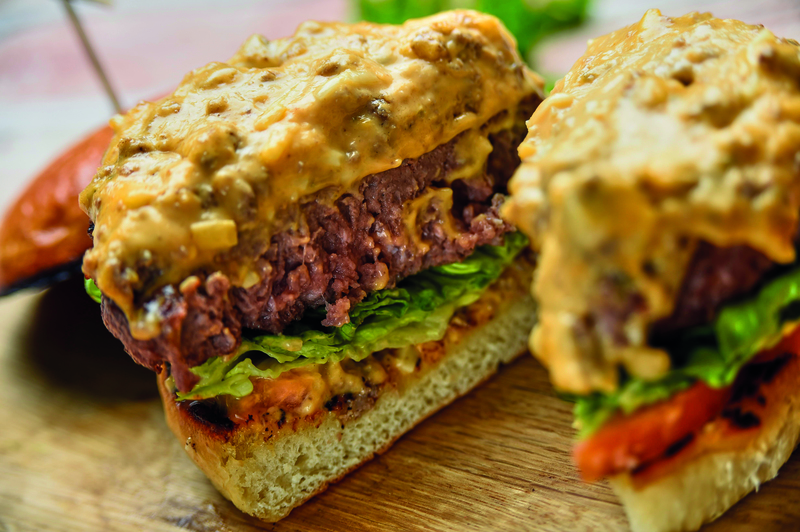 Drizzle with lashings of House of Lords Deluxe BBQ Sauce and then cover with our Love Fresh Cheeseburger Melt. Place under a pre-heated grill for one minute and let our melt go to work. Finish by arranging the onions all over the top. Delicious! Use 150g of French Fries and 75g of Love Fresh Cheeseburger Melt. Deep fry or oven bake the fries and place in a serving dish. Pour our Cheeseburger Melt all over the fries. Chop and slice a rasher of cooked bacon and scatter over the fries and melt. Then place under a pre-heated grill and warm through. Once out of the grill, drizzle with House of Lords Deluxe BBQ Sauce and Oasis Garlic Mayonnaise. Finish with a scattering of chopped chives. Eat and enjoy! The sandwich with a difference! Open a soft brioche baguette and sprinkle generously with grated cheddar cheese. Place under the grill for one minute. Add six rashers of cooked streaky smoked bacon and then place eight Harvest Farms Chicken Fries over the top of the bacon. 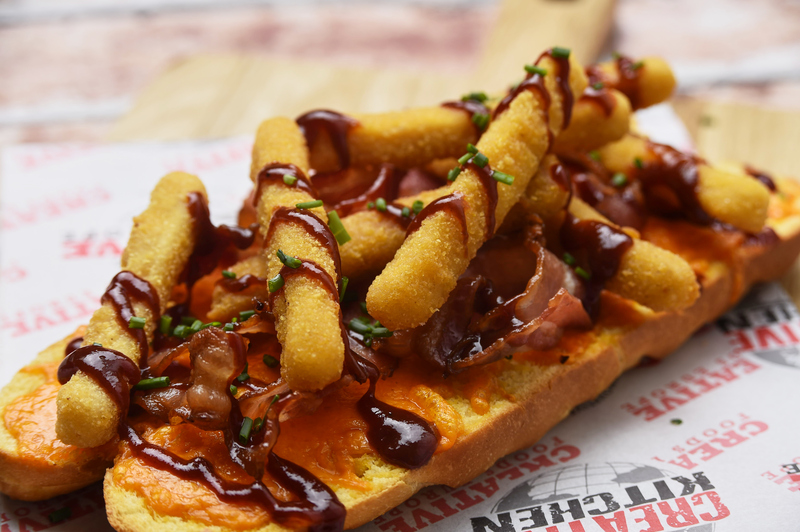 In America an open sandwich is often described as a Po’ Boy. It’s considered to be a traditional sandwich in southern regions such as Louisiana and BBQ Po’ Boys are a common feature on menus in the Texas region. A quick and easy chicken snack. Take ten Harvest Farms Chicken Fries and one fast food carton. After frying place the fries in the carton and serve with a choice of dips, French Fries or salad. So convenient, easy to prepare, easy to eat, grab & go! Place four 4 inch tortillas in a taco stand. Add a piece of fresh gem lettuce to each tortilla followed by some pickled red cabbage. Place eight Harvest Farms Chicken Fries, two to each tortilla on top of the lettuce and pickled cabbage. Liberally spread 40g of tomato, red onion and coriander salad across the top of the chicken fries and drizzle with a smoked paprika and chive sour cream. 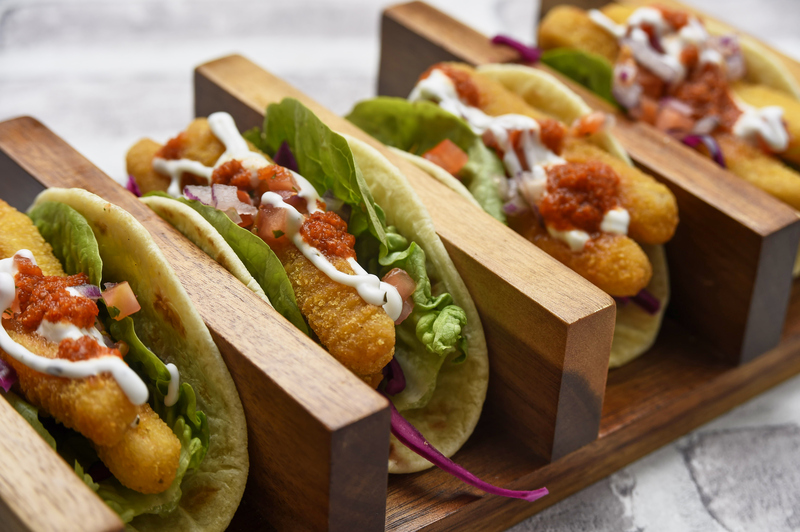 To round off this delicious taco delight add a dash of red hot salsa. Enjoy! 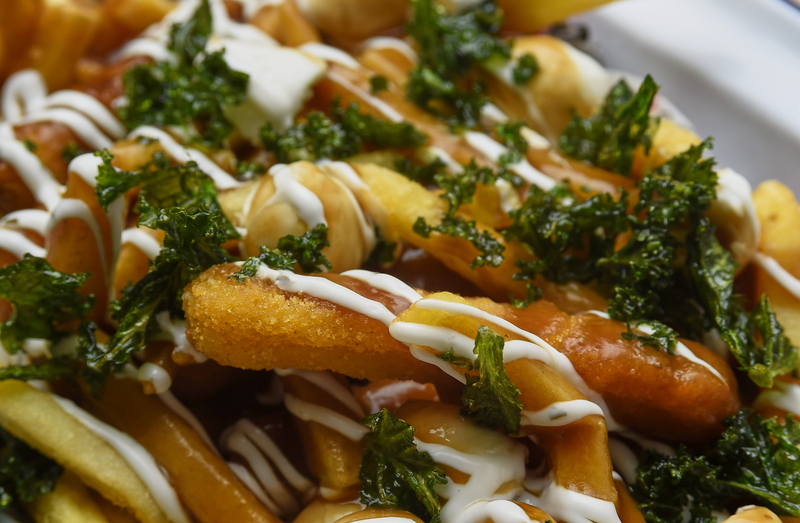 This fantastic indulgent snack originates from Quebec in Canada where it’s known as a Poutine. It’s popularity spread into other regions of Canada, then into the USA and is now becoming popular in Europe. 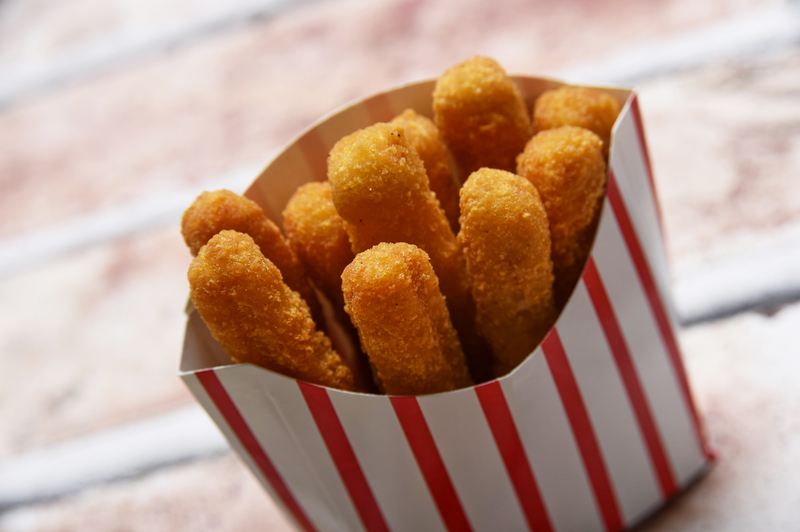 Place 100g of French Fries in a serving dish and add ten Harvest Farms Chicken Fries. Then get going with the indulgence! Pour over 100ml of rich hot gravy, add some delicious mozzarella pearls, drizzle with a sage and onion mayonnaise and finally sprinkle with crispy kale. This is an indulgent delight, a treat for everyone! 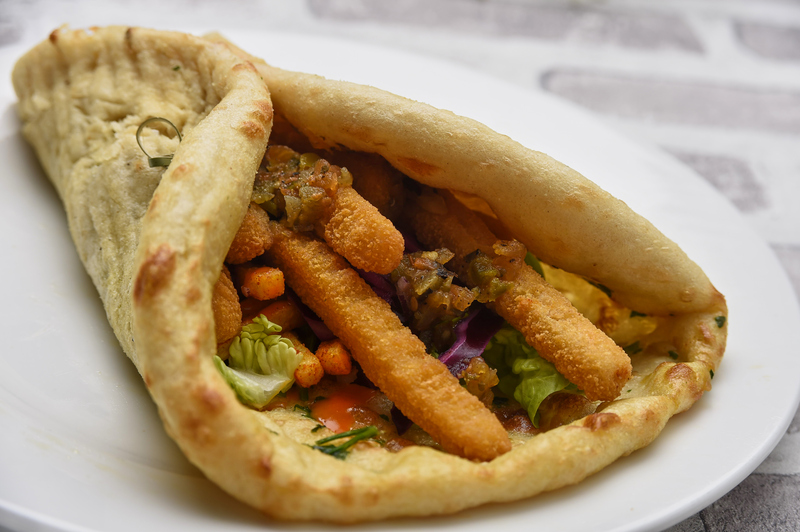 Originating in Cyprus and the Greek Isles where this dish would be found on menus as a Chicken Gyros. Place seven Harvest Farms Chicken Fries on a garlic flatbread. Add 50g of seasoned French Fries and garnish with five leaves of freshly chopped gem lettuce. Sprinkle the lettuce with a mixed salad of tomato, red onion and coriander and add 30g of pickled red cabbage. Finish with a flourish of Louisiana Hot Sauce and green salsa. A hot delicious tasty treat! Barbecue pulled jackfruit has been described as a vegan alternative to pulled pork. Veganism is a huge health trend at the moment, especially with more and more people looking to reduce meat in their diet and looking for plant based dietary options i.e. flexitarians. 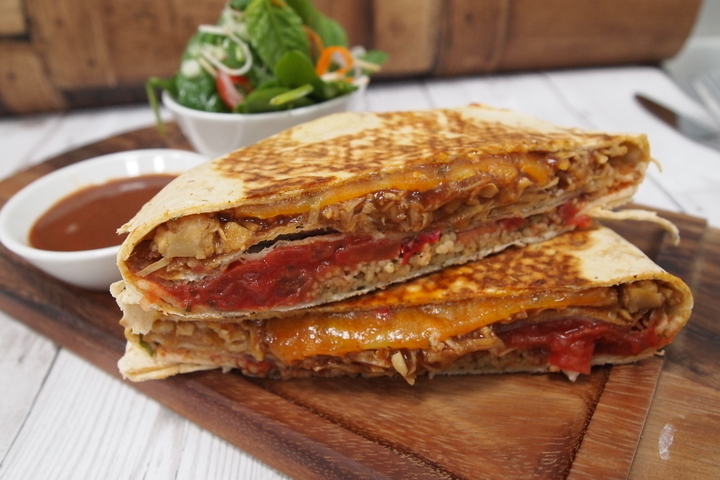 Fill a crunchy tortilla with Love Fresh Barbeque Pulled Jackfruit Filling, couscous, salsa and vegan cheese. 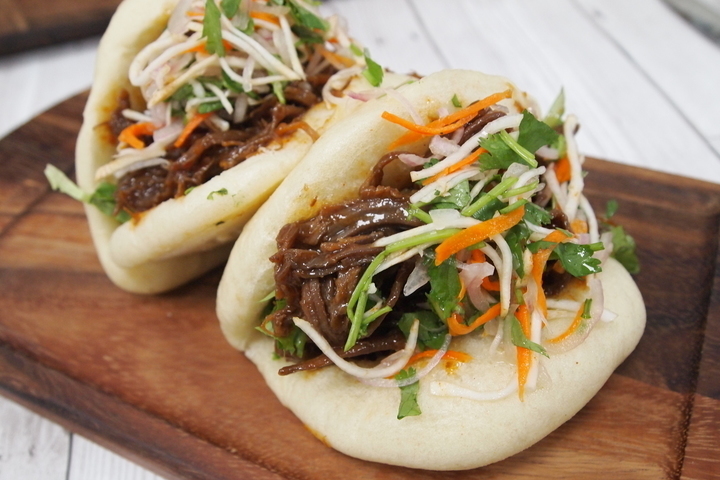 Pulled meats and Korean inspired dishes are on trend. The younger generation are well travelled today and more exposed to different cuisines and ethnic flavour profiles. Korean BBQ is a hybrid fusion of flavours and ethnic cuisine. East meets West. 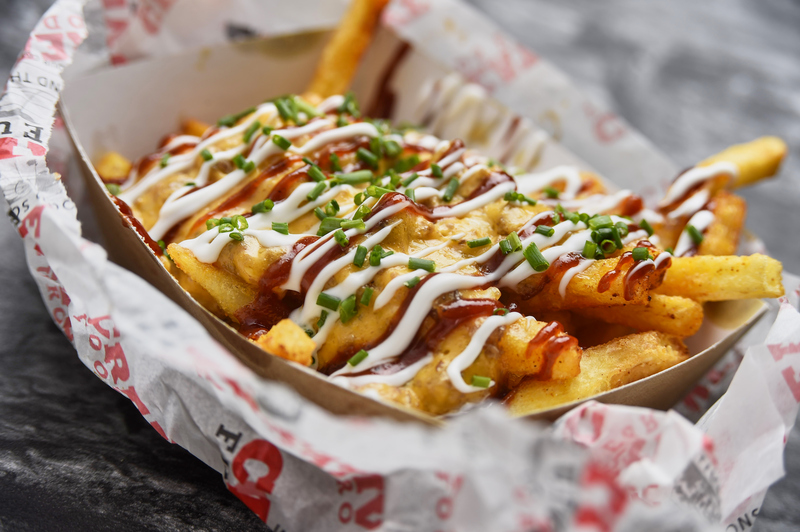 Korean flavours is also an emerging food cuisine trend - married with BBQ creates a fantastic product that fits well with street food and the growing population of foodies. Shredded tofu with kidney beans and chickpeas in a spicy tinga sauce. 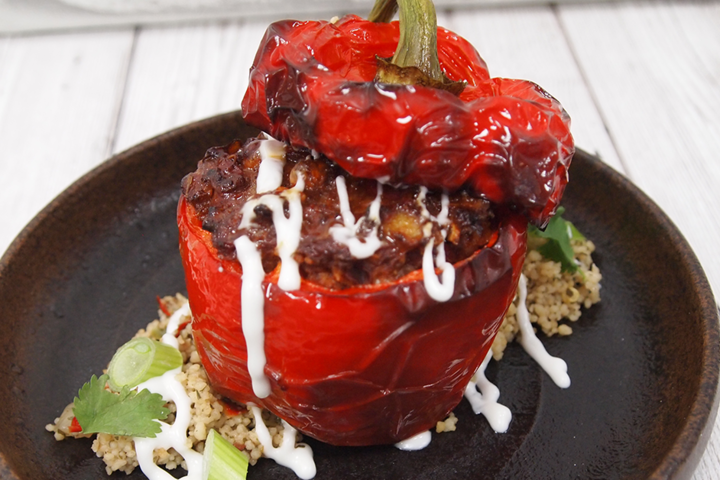 This is a vegan filling so caterers can benefit from ticking the vegan box on their menus! Tofu is no longer just a meat substitute for those following a vegan or veggie diet but with flexitarians on the increase and today’s consumers becoming more health conscious, tofu is also seen as a reliable source of protein. Try creating this Jackfruit Flatbread with Love Fresh Barbeque Pulled Jackfruit Filling. Place the flatbread onto a grill to heat through. 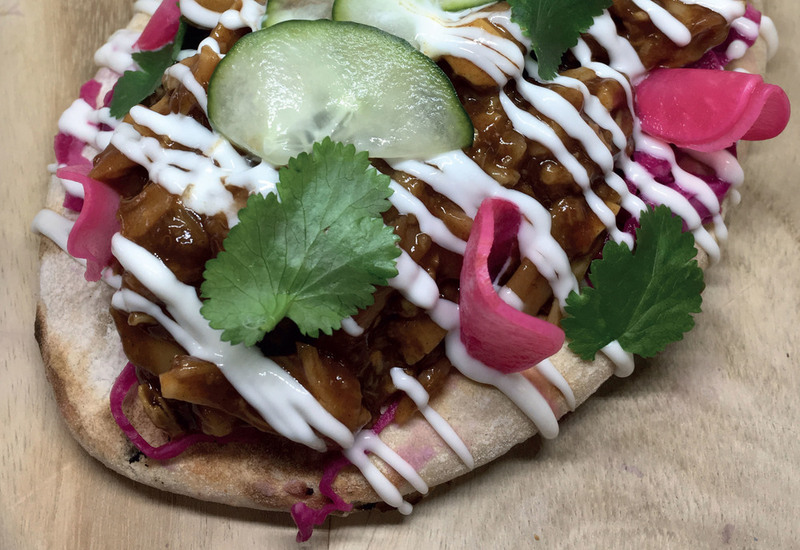 Arrange pickled red cabbage onto the flatbread. Pile the Love Fresh Barbeque Pulled Jackfruit onto the pickled red cabbage. Drizzle over the Vegan Mayonnaise. Arrange slices of cucumber and more pickled cabbage over the top. Garnish with coriander. Here’s a twist on chicken wings! 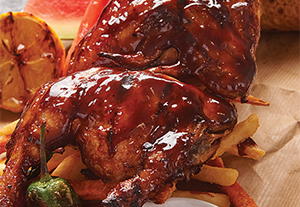 Try some succulent Harvest Farms Chicken Tulips and after cooking smother in our traditional Deluxe House of Lords BBQ Sauce. To finish sprinkle with chopped chives and serve with charred corn, lemon and gherkins. For a snack with a difference try our fun-sized Harvest Farms Pop In Chicken tossed in our Deluxe House of Lords BBQ Sauce. 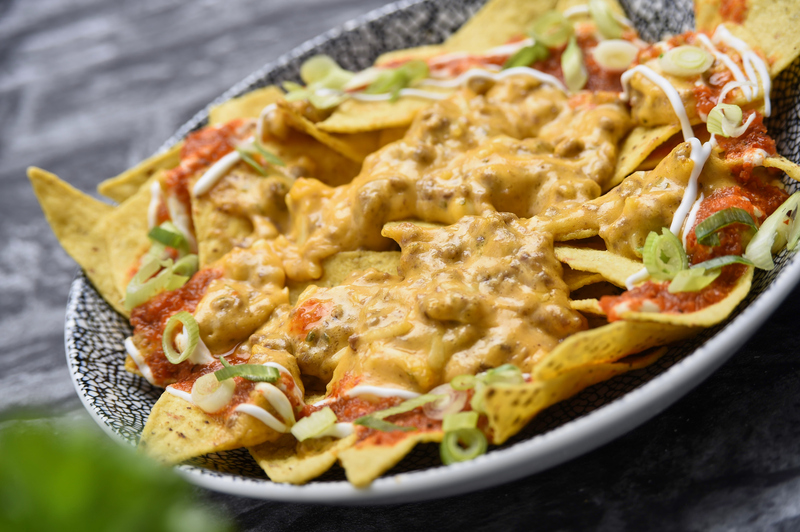 Top with a nacho cheese sauce, crushed tortilla shards and serve with a tomato, onion and coriander salad. For a quick and easy starter try some crispy Harvest Farms Coated Buttermilk Chicken Wings tossed in our TABASCO® spiced House of Lords Louisiana Blazing BBQ Sauce for a starter with a real kick! 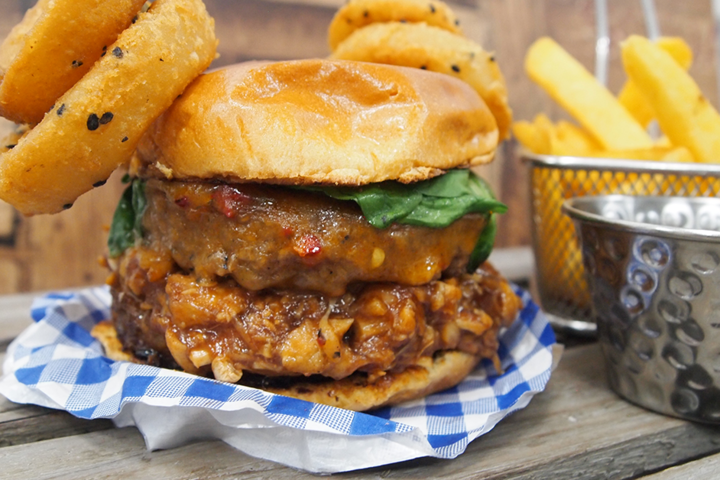 Match a Deep South Harvest Farms Louisiana Chicken Burger with our TABASCO® based House of Lords Louisiana Blazing BBQ Sauce. Top with dirty rice, charred onions and peppers then finish with some spiced cheese for the ultimate fiery burger. On your marks for another starter! Take our crispy Harvest Farms Duck Wings and after cooking glaze with some House of Lords Sticky Korean BBQ Sauce and serve with Asian noodles. For a salad with a difference, place some tender Harvest Farms Karaggi Chicken Bites wrapped in a crispy soy and ginger coating next to a grilled Asian green salad. Drizzle the chicken with our House of Lords Sticky Korean BBQ Sauce. For a simple but tasty easy to prepare starter, take some Harvest Farms Roasted Chicken Wings and after cooking drench them in our House of Lords Texan BBQ Mop. For an impressive sweet and savoury waffle stack, top fluffy sweet waffles with our Harvest Farms Rosemary and Buttermilk Chicken Goujons. Add some maple bacon then top it all with a fried egg and a drizzle of House of Lords Texan BBQ Mop. O’ Sweet Carolina! Take a Harvest Farms Buttermilk Chicken Fillet and top it with smoked bacon, caramelised red onions and frickles. 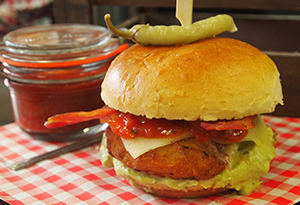 Finish with our House of Lords Carolina Mustard BBQ Sauce for a sensational chicken burger. 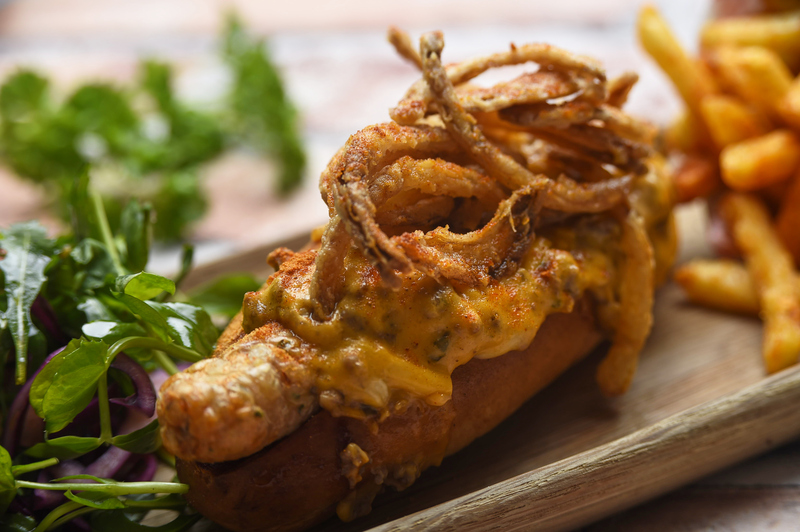 For a unique and tasty hot dog smother a smoky frankfurter with Monterey Jack cheese, caramelised red onions and crispy gherkins. 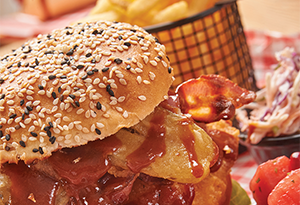 Drizzle all over with our House of Lords Carolina Mustard BBQ Sauce. For another impressive starter smother some crispy Harvest Farms Southern Fried Pop In Chicken in our House of Lords Reduced Salt Deluxe BBQ Sauce. Sprinkle with crispy onions, bacon bits and chopped chives. A chicken schnitzel with a difference! After cooking top a Harvest Farms Panko Schnitzel with a generous helping of House of Lords Reduced Salt Deluxe BBQ Sauce and Monterey Jack cheese. 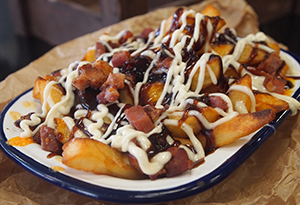 Serve on a bed of TABASCO® spiced fries and smokehouse slaw. For a main meal classic brush a tender Oliver James slow cooked Half Chicken with our glossy House of Lords Kansas City BBQ Glaze. Serve with a pink slaw and TABASCO® seasoned tiger fries. Kansas is the home of BBQ Sauce! Liberally brush House of Lords Kansas City BBQ Glaze over some chargrilled Harvest Farms Double Joint Chicken Wings and serve! For a delicious main meal try some Oliver James succulent slow cooked Pork Ribs, double glaze them in our smoky House of Lords Hickory BBQ Sauce and serve with an Oliver James Jalapeno Cornbread. Put a new sandwich on your menu! Drench some Harvest Farms Shredded Chicken with our House of Lords Hickory BBQ Sauce. Serve with streaky bacon and cheese and sandwich everything between two slices of Texas toast. Toast the waflles and cut following the lines to create croutons. Grill the bacon rashers crispy then cut the bacon into large dice. Wash and tear the cos lettuce into large pieces and place into a bowl. Toss with the diced cooked bacon and the Atlantic Sauces & Dressings Caesar Dressing. Deep fry the Southern Fried Chicken Goujons and drain well when cooked. Just before serving, mix the waffle croutons into the cos lettuce. 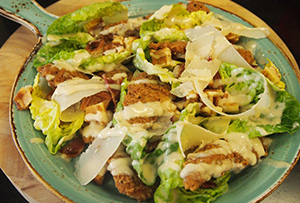 Finish by scattering the chicken goujons over the salad and topping with the shaved Parmesan. Deep fry the chicken fillet and drain. Top with the cheese slice and keep well warm to allow the cheese to melt. Spread the Love Fresh Guacamole over the base of the burger. Place Love Fresh Salsa over the Guacamole, then top with the chicken fillet. Lay the cheese over the chicken followed by the bacon. Finish by squeezing over a generous amount of the House of Lords BBQ Sauce. Top with the bun top and serve. Cook the onion with the bacon in a frying pan until cooked. Set to one side. Cook the chips. Drain well and season with salt. Place chips into a serving dish and scatter over the cheese to cover. Top the cheese with the bacon and onion mix. Place under a grill to melt the cheese. Before serving, squeeze over the BBQ Sauce followed by the Chicken Flavoured Mayonnaise. Cut the sub rolls horizontally but leaving the two halves still attached. Spread each half with the houmous. Divide the meatballs evenly between the 4 sub rolls. Scatter over the crumbled Feta cheese. Place under a hot grill to melt the cheese. 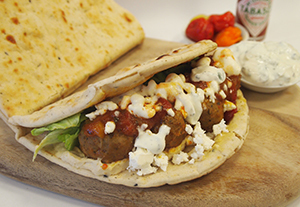 Spoon over as much Tzatziki sauce as you like over the sub. Fold the 2 halves together and serve with the TABASCO® sauce for added heat.